The Jeep is as American as apple pie. Born out of the United States’ effort to develop a suitable ‘General Purpose’ vehicle for troop movements and battle, the Jeep quickly became a visual representation of American versatility, ingenuity, and dominance. After 70+ years, not much has changed. Jeeps can be seen everywhere in virtually endless variations. Since their introduction as a commercial vehicle, owners have personalized their Jeeps in ever increasing ways to accommodate all kinds of weather and terrain. So, let’s take a look at how Jeeps have been evolving as an American icon. As soon as Jeeps became available to the public, they were being modified. 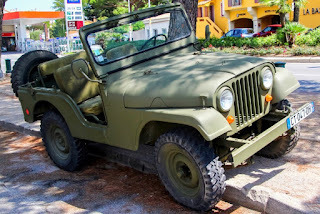 Post WWII, Willys-Overland, the manufacturer of the military Jeeps, marketed the early civilian Jeeps as a workhorse with many farmers and laborers modifying them for their personal needs. Considering many farmers needed both a tractor and a truck, the Jeep was a perfect solution. Many post-war Jeeps were sold on the open market, which made obtaining one much easier for those with limited means. This helped solidify the Jeep brand in the hearts and minds of Americans from all walks of life. Into the 1950's and 1960's, the Jeep saw an explosion of popularity due to the release of a line of fully recreational vehicles. Increased horsepower and additional cabin room answered the concerns of previous Jeep owners who loved their Jeeps, but wanted a more comfortable ride. While models like the bigger Wagoneer were introduced, this was also the beginning of the more sophisticated soft top convertibles. Early Jeeps had no tops and windshields that folded down. The new Jeep CJ-5 and CJ-6 models included not only sleek, removable convertible tops, they were equipped with more comfortable seating, storage space, and vastly improved off-road capabilities. The 1970's and 1980's saw the introduction of the first full-time 4-wheel drive system, as well as the introduction of the CJ-7 and iconic Jeep Wrangler. The CJ-7 incorporated chrome bumper and grille with the option for automatic all-wheel drive known at the time as ‘Quadra-Trac.’ The Wrangler was considered to be a much more sophisticated Jeep with an improved interior design, wider track, and improved handling. By this point in time, the Jeep brand had passed through several hands including the American Motor Company which was sold to Chrysler. Chrysler took the Jeep to a new level by introducing the first compact SUV with shift-on-the-fly 4x4 capabilities. By the 1990's and into the 2000's, Jeep was able to improve the on-road and off-road handling to deliver a smoother ride than ever before. The introduction of removable doors, as well as soft and hard top panels made Jeeps the perfect outdoor vehicle. In the early 2000's, Jeep introduced the all-mighty Jeep Wrangler Rubicon. The Jeep Rubicon is the powerhouse of all Jeeps. The newest Jeep Rubicon models are truly a sight to behold. The Rubicon has been completed upgraded with a modernized interior, advanced 4-wheel drive capabilities, electronic stability and traction control, and a powerful 3.6L V6 engine. The Rubicon combines everything great Jeep has to offer into a single exhilarating package. Whether you’re a Rubicon or vintage CJ-5 person, good times await you on and off the beaten path when you join the Jeep family. The wide range of Jeep offerings and affordability means there’s something for everyone to enjoy. What are your favorite models from Jeep’s past? Share your stories with us in the comments!